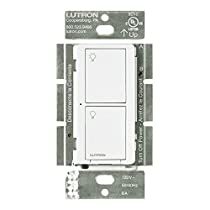 The Lutron PD5SDVWH is a 5 amp RF switch in white. It features 2 buttons that can control multiple load types. This switch automatically controls energy loads through wireless remote controls and wireless sensors.The whole light control system is designed to provide convenience, energy savings and ease of installation. This switch features a Lutron Clear Connect RF technology, which provides wireless connection with both Pico wireless controls and Radio Powr Savr sensors. It's a great solution for complicated retrofit applications. I've been playing around with the Lutron Caseta dimmers, together with their Smart Bridge. The combination works great - and it's even better when combined with the Logitech Home Control remote. Having said that, I don't really want dimmers on every light; and, a standard switch makes more sense in a lot of cases. That's where this switch comes in! 1) It works perfectly with the Lutron Smart Bridge - so it can be run on a schedule, as well as turned on or off remotely. 2) It's intuitive to use. 3) These switches look great. 5) When combined with the Smart Bridge, it can also be controlled using the Logitech Home Control remotes. The biggest downside to these is availability (at least for now). For some reason, the dimmers are far more available; and, as a result, they tend to be less expensive - which is seriously irritating. Anyway, if you're looking for standard switches to add to a home automation setup with the Lutron Smart Bridge, this is the product you're looking for - and we're very happy with them. Automation at a good price!!! This switch is great, and it work great with the Wink hub and app. Unlike the Lutron dimmers, this switch MAY need a neutral wire. I only had one load that required I use the supplied jumper wire to neutral. If the wire is required, the switch will blink red intermittently to let you know to check the wiring. 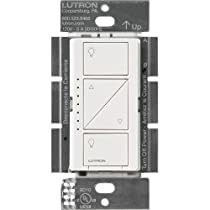 Have been purchasing Lutron switches to replace old mechanical switches and to pair them with the Wink Automation. Previously, I had purchased PD-5WS-DV-WH version which were a little more expensive, but were branded Caseta. After reading a post about the PD-5S-DV-WH version also being compatible with Wink, I tried these which were a little less expensive. After installation, they worked great with Wink and appear to be just as reliable as the PD-5WS-DV-WH version. Very pleased with the purchase and the automation has been working fine with Wink. 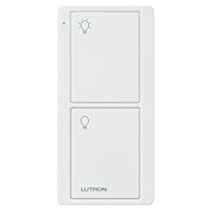 If you want to automate your home lighting and want a nice modern switch look, Lutron light switches are a great way to do it. Switch does not require any neutral and works will with CFLs and LEDs as I didn't have any loading issues.